To kick off 2006 in style, we’re trying something a little different. Solution Page. And please let me know if this idea appeals to you. Finally, don’t miss the ‘Updates’ feature at the bottom of the page! 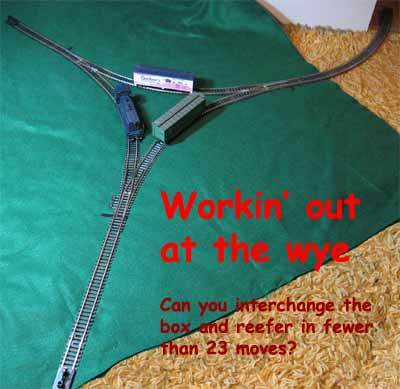 This classic railroad puzzle, used in many intelligence tests and creativity exams, is deceptively simple. Two trains meet face to face on a single track. There’s a single short siding that can hold only one car or one locomotive at a time. A car cannot be coupled to the front of either locomotive, although both locos can push cars ahead of them. The problem in a nutshell: how can these two trains pass each other and proceed on their ways? 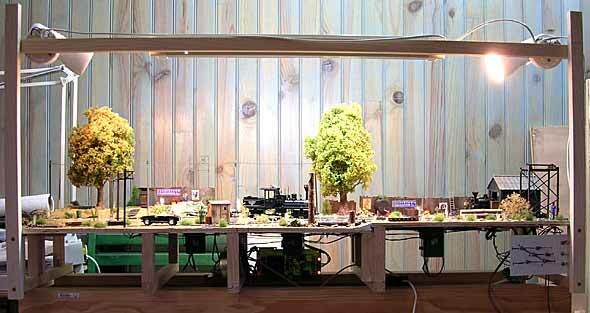 Notice that we have backdated this 1x3ft (30x90cm) micro layout to the 1880’s using two of Bachmann’s tiny American 4-4-0 N-scale locomotives. 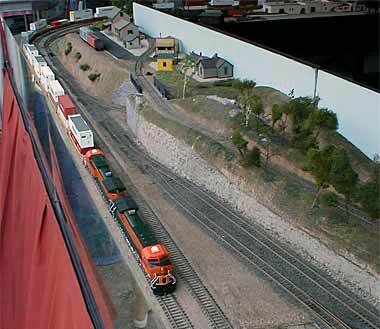 The train on the left has one orange coal car; the train on the right has two cars — a red gondola and a green boxcar. All rolling stock is Bachmann. Can you solve this puzzle? How many moves did it take you? (A move is one loco movement, from the moment it starts up until it stops, with or without cars attached). Solving this one took me 16 moves. HERE’S A PIZZA LAYOUT WITH A DIFFERENCE! Alexander Lehmann, from Mannheim Germany, sent me this classic railroad puzzle remarking that it would make an excellent pizza layout for exhibition use. The objective is to exchange the positions of the two cars (green and blue), with the locomotive (white) returning to its original position. The cars are too tall to go through the tunnel, and the loco may go through the tunnel no more than twice. There are several ways to solve this problem. My shortest solution takes 16 moves. Can you do better? This is the easiest of these three puzzles, so no solution is given. But here’s a hint: each car will occupy the spur track at some point during the course of the solution. Good luck! This interesting puzzle was shown in a textbook on logical thinking. 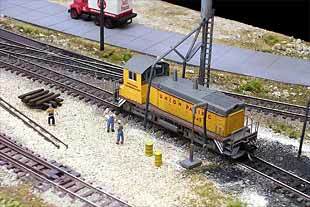 The 4x3ft HO layout is a minimum-sized wye at the end of a long branch spur (from the upper right). Two cars–a green Santa Fe boxcar and a pink-and-white Gerber reefer–occupy two legs of the wye. The switching locomotive (a blue SW7) occupies the third leg (don’t ask how it got there!). The objective is to exchange the positions of the two cars, with the loco returning to its original position. The spur at the upper left will hold only one car and is too short for the locomotive. The spur at lower left can hold two cars or one car and the loco. My best effort is 23 moves. Can you do better? 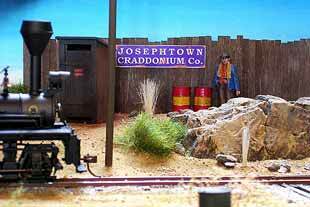 Fabrice Fayolle, from Amiens, France, sent some recent photos showing progress he’s making on his N-scale portable layout, Point Davis, Oregon. The track plan for this U.S.-prototype exhibition layout was shown in SCRAPBOOK #42. MORE ON SMALL WALL-MOUNTED LAYOUTS! Swelling the ranks of flat-panel, wall-mounted micro layout builders (to 3!) is Tim Stolle, from Vancouver, Washington USA. The original flat-panel design is located in our Micro Layout Design Gallery, under Amalgamated Mine #258. Tim has added some ideas from a recent visit to Galena Mine near Wallace, Idaho. Sounds terrific! I can hardly wait for the next update! Las Cajas Avenue has appeared in several previous updates to the SCRAPBOOK. It’s been under construction by Jeff Hartmann, from Long Beach, California USA. The layout itself measures 36x10in (90x25cm) and represents an old-time switching district. 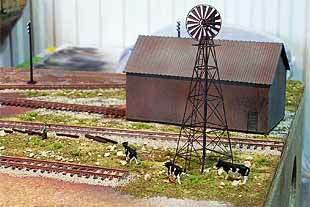 Jeff is now putting on the finishing touches and sent these photos of the layout in its “semi-final” condition. For more, see his website.